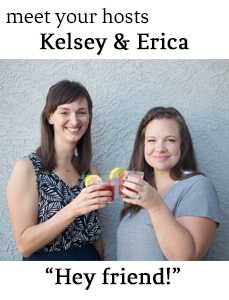 We're sipping on this tasty cocktail while chatting about our hometowns of Austin, TX and Racine, WI and the pros and cons of moving away. Fill two glasses with ice. Into each glass, pour half of the bottle of beer and then half of the ginger beer. Top each drink with a generous squeeze of lime and give it a stir. Ahhh, tastes like home. Kelsey just returned from a visit back to Austin where she hit up SXSW. Her favorite spots include Alamo Drafthouse for a quote along, and she could wander around Whole Earth, and Book People forever. When Erica heads back to Wisconsin she has to hit up Lake Michigan and must get some decent pizza. Although Salerno's is the best she's found in Arizona. We both travel back and forth quite a bit and have some very strong feelings about Southwest and snacks for air travel. Kelsey is currently obsessed with her Hydro Flask for keeping her morning coffee hot. Speaking of hot drinks, Erica has a new tea obsession. A recent visit from her brother David (who also created our new theme song!) sealed the deal. On his recommendation, her current favorites are his signature blend of Earl Grey and Earl Grey Creme and the Samurai Chai Mate from Teavana. In neighborhood news, we are discussing the wild animal kingdom that is our area this time of year, and we introduce you to Shorty the dog. Kelsey is also irked by some very dead bushes. Be sure to subscribe to all our episodes by email or on iTunes. We'd love to hear from you in the comment section or in your review on iTunes. Thanks so much for listening!